"Don't be too sure I'm as crooked as I'm supposed to be. That kind of reputation might be good business. "-Samuel Spade, private investigator "Spade...is what most of the private detectives I worked with would like to have been and in their cockier moments thought they approached. 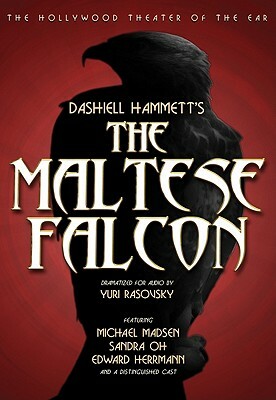 "-Dashiell Hammett The Maltese Falcon first appeared in the pages of Black Mask magazine in 1929. Almost immediately it was acknowledged as not only a great crime novel but an enduring masterpiece of American fiction. Sam Spade, its protagonist, is the archetypal tough, cynical PI, "able," as his creator explained, "to take care of himself in any situation, able to get the best of anybody he comes in contact with, whether criminal, innocent bystander or client." And what a client -the irresistible and treacherous femme fatale Brigid O'Shaughnessy. Believing the book's vividly drawn characters and memorable dialogue cry out for theatrical treatment, Blackstone Audio commissioned this faithful dramatization by the award-winning Hollywood Theater of the Ear, in which a brilliant cast brings to life all the excitement and suspense of Hammett's original in the playhouse of the mind.